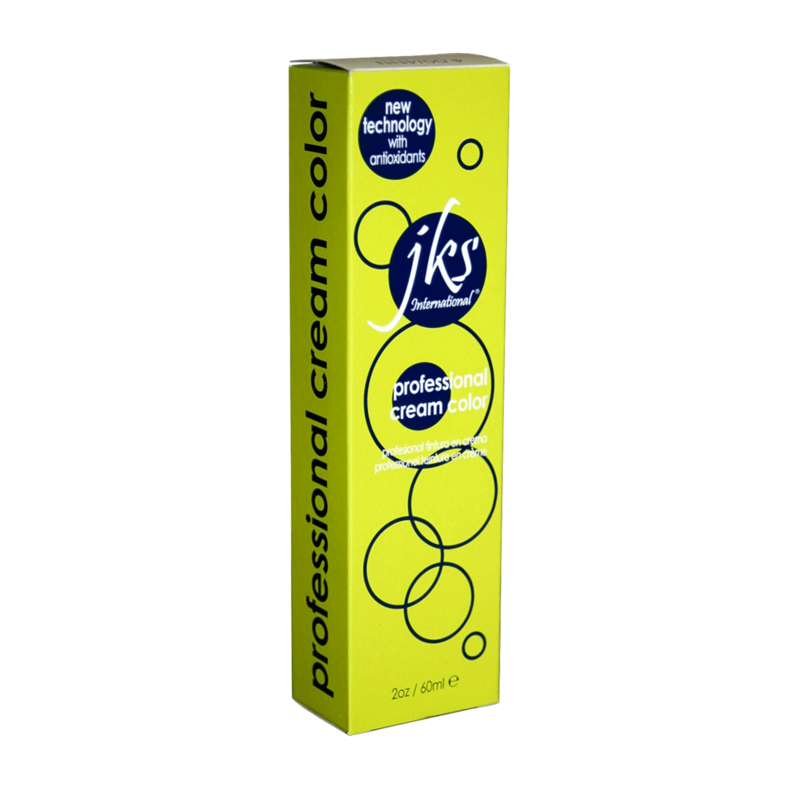 JKS International award winning Italian Cream Hair Color, created by a hairdresser, for hairdressers. Whatever you envision for your canvas, you can achieve with this double pigmented, low ammonia haircolor with antioxidants. Guaranteed 100% grey coverage, added shine, and healthier hair. A single tube can be used for permanent, demi, semi, and 98% ammonia free hair coloring just by changing the developer and mixing ratio. The new HP Technology with Antioxidants provides the proper nourishment to restore the main hair components: water, proteins, and lipids. Low molecular weight oligopeptides provide intense repair and maximum protection, binding tightly to the hair proteins, providing restructuring and great benefits from within. A special anti-irritation molecule creates a protective film for skin and hair during processing. Balanced and double pigmented, with low 0.5% ammonia (in most shades) provides gentle 100% grey / white coverage and the hair is left in better condition than before coloring. "I’ve been using this color for several years. I get Amazing results and save tons of money. Pure Italian color at a very affordable price. I’m so excited it is now available through Cosmoprof!!!!" "Thank you Cosmoprof!! It's about time you guys carried the best Italian Color line, that has saved me thousands of dollars over the last few years. Every time I do a color, I thank JKS for giving us such a superior hair color, at such a great price. Now that Cosmoprof carries it, I'm sure lots of my hairdresser friends will start using it. My clients love this color because it does not fade, gives effortless gray coverage, the hair is conditioned during the color process (thanks to the antioxidents), the beautiful shine, and amazing color tones that other brands could not come up with. You ought to try and see the unmatchable, beautiful results !!!!!!!" "Yeah, now we can get our order from Cosmoprof faster, thanks to the hub nearby. We have been using JKS color in our salons since Feb 2013 (over 5 years). We knew that changing the Color line would be hard on our stylists, but it was know where as difficult as we thought it would be. With the savings, now we can offer to our stylists, more bonuses, new equipment, and remodeling that we promised. JKS is the best hair color that we have ever used in our salon since we opened. Savings plus the better product is an unbelievable pair, but it does exist with JKS." "I've been using JKS color for over 7 years. The best color line on the market for an incredible price. I wouldn't think of using anything else. Finally in Cosmoprof. It's about time!" "I've been using JKS color for several years. The best brand on the market. If your not using this color your throwing your money away."